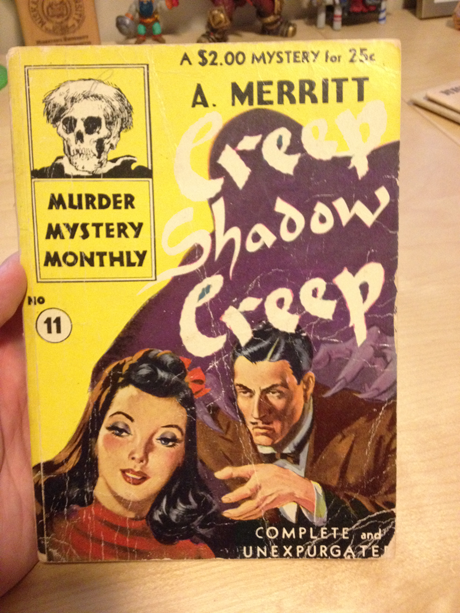 My copy of Creep, Shadow, Creep (which I believe was originally titled Creep, Shadow!) arrived today, and it’s by far the oldest physical book in my expanding Appendix N library. It promptly fell out of its cover, but should still be quite readable. Today publishers as well as shipbuilders have their part to contribute in our all-out Victory effort. 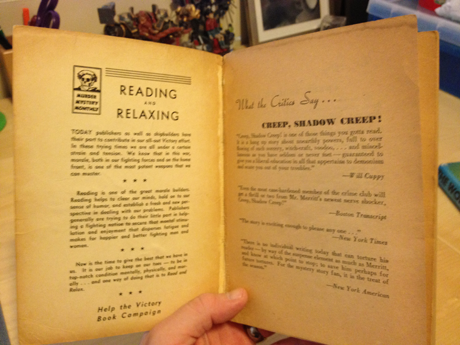 I also noticed a footnote at the end of the page referring the reader back to Burn, Witch, Burn, and thereby learned that this is actually a sequel (to a book not listed in Appendix N). I’ve updated the 100-book reading list accordingly.